You are here: Home / News / Dogs Finding Dogs…and Cats, Too! This weekend, National Geographic Wild will be releasing a show called “Dogs Finding Dogs.” It features a group who offer a service of search dogs tracking the scent of lost dogs. As glad as I am to see a show about lost pet recovery on TV, there are an increasing number of groups training dogs to find other dogs who have a very different philosophy than what I have regarding the training methods that should be used and the canine candidates they’d pick for dogs finding dogs! The main difference in the training methods comes down to the difference between a method called “tracking” which is taught to most police dogs and involves teaching a dog to put its nose on the ground and follow a fresh track (i.e. an hour old track) verses scent discrimination “trailing” which involves motivating a dog to follow a cloud of scent that can be several days old. 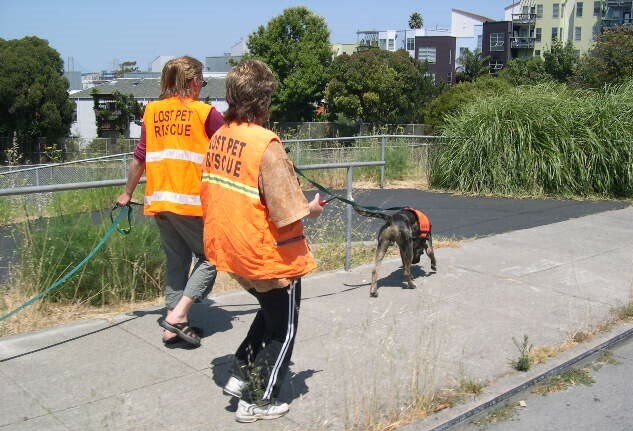 MARN Director Kat Albrecht training MAR Trailing dog Boone (San Francisco, 2006). In my professional opinion, training a dog to find other dogs is a process that requires building a sense of excitement and strong motivation. In order to learn to “read” a search dog, you must select and train a dog that is highly motivated to find other dogs. The dogs accepted into our Missing Animal Response Network (MARN) training program are dogs that love to play with other dogs. These dogs (many breeds, not just hunting or hound dogs, can be trained) must demonstrate strong excitement when they see another dog runaway and hide. This technique is called “puppy runaway” games and they are the basis of how most police bloodhounds (and other breeds) are trained in search-and-rescue work to find lost people. The puppy runaway games ultimately transition into more difficult training exercises including trails aged several days. On average it takes MARN students anywhere from 12 months to 18 months before their search dogs are ready to begin search work. This was only Siri’s third “puppy runaway” training session and was his first time working an “urban” trailing practice. For the exception of Siri being distracted by marking / peeing along the way (an issue that is being addressed and, pardon the pun, “eliminated” in his training), this dog (and handler) is doing an incredible job showing the motivation / desire that is needed for dogs finding dogs. Training is critical if you plan to use dogs finding dogs! Other aspects of lost pet recovery are essential. A search dog and tracker is only one of many tools available. All of my students who plan to train a dog to find lost pets are required to take the 10-week MAR Field Course to learn how to search for and recover lost pets. Those interested in training their dog to find lost pets are encouraged to use my book Dog Detectives as a training guide. In addition, I offer an online 10-week MAR Search K9 Course for anyone who feels they need training assistance. To train your dog to find dogs through the MARN program, you need a dog that has no fear issues, no aggression issues, a strong love to play and chase other dogs, a desire to stick with the training, and six hours a week. 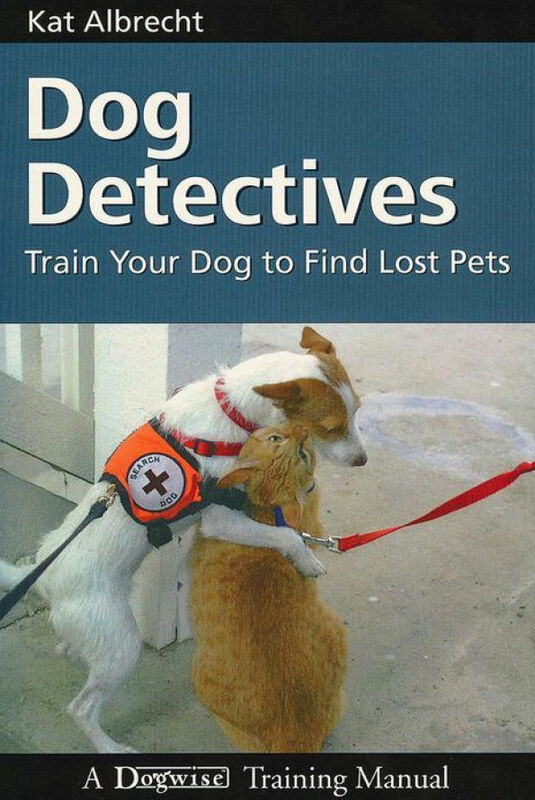 I’ve been training dogs to find lost pets since 1996 and have authored the only book on this subject. My training is bringing lost pets home on an international basis. I am very proud of my reputation and the reputation of the people I’ve trained. The group featured on this show was not trained by me and is not part of the Missing Animal Response Network. I am pleased to say that I have trained (and continue to train) dogs just like Siri who’re doing a great job of finding lost dogs and cats!